What kind of USAGE STATISTICS do you provide for institutions? Our statistics portal is designed to be user-friendly, intuitive, and compliant to the latest standards. We understand that it can take time to become familiar with new reporting environments, so we provides a Help section in the top navigation bar along with a Help widget to guide you through reporting steps. The new portal was implemented at the end of 2018 and contains statistics from December 2018 onward. Previous statistics are available, but these must be ordered at feedback [at] pdcnet.org. Go to https://www.pdcnet.org/collection and under SUPPORT find Switch Account and log in with your admin ID. Under YOUR ACCOUNT in the navigation bar find then the link to User Statistics. This will take you to user statistics portal. 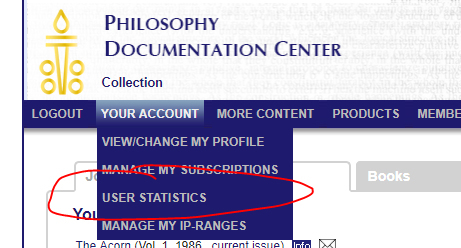 You will first see the overview page of your user statistics. Current statistics for each month will be available in the portal on the 15th of the following month.